Don’t you wish your energy bills were lower so that you would have more money in the bank? If you are feeling like you are paying too much on your energy bill, then you probably are. A home energy audit is your trick to finding out exactly what is causing those inefficiencies and save money every month on those energy bills. Besides saving you on your monthly bills, there are also tax credit incentives and state rebate programs that can save you even more money. 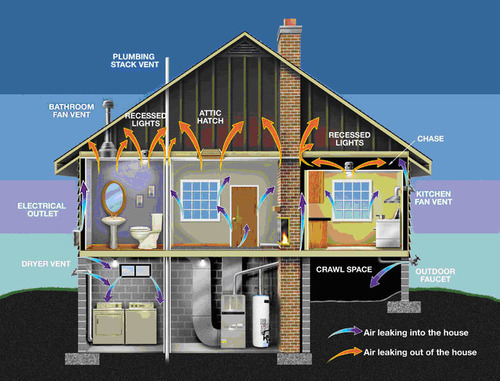 Now is one of the best time to upgrade your home and increase its energy efficiency. In short, a home energy audit helps identify precise locations of where your home is losing energy and what measures can be taken to to make your home more energy efficient. It is possible to complete a DIY audit on your own, however, if you’re looking to renovate your home for higher efficiency levels, leave it to an expert in the field. You’ll be thankful in the long run. Upon completion, your technician will provide you with a variety of possible solutions to help make your home more efficient. Also, keep in mind that when purchasing a new model of any kind, rebates may be included! These rebates may help offset the cost of new installations. Gold Medal Service works with you to get you the most money back. By adding a high-efficiency heating and cooling system, you are eligible for attractive rebates and monthly savings. Here is a fantastic infographic by energy.gov that goes over what a home energy auditor looks for and what equipment they use to find sources of inefficiency. The truth is, there are so many things you can do to your home to make it more energy-efficient. Even if you have a small budget, start with the minor areas. Do the best with what you have and you’ll notice a difference. What matters most is that you’re making an effort to change for the better. Start the New Year off right by giving us a call at (732) 365-3199 or visiting our website. To schedule HVAC, Plumbing, and Electrical maintenance/repair or installation, contact the professionals at Gold Medal Service. We'll be there with our same day service guarantee!